WASHINGTON, D.C.—House Republican Whip Steve Scalise (R-La.) gave remarks at the Energy and Commerce Committee markup of 14 bills in support of an amendment offered by Rep. Brett Guthrie (R-Ky.) to H.R. 1644, the Save the Internet Act. 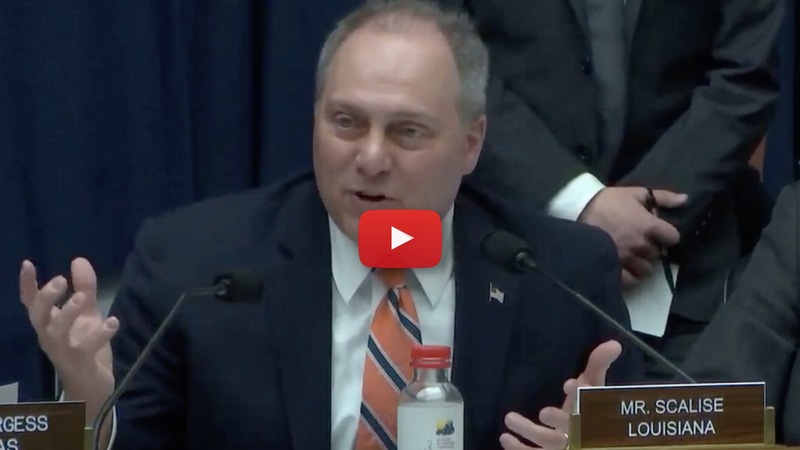 While voicing his support for this amendment that would promote 5G innovation, Whip Scalise stressed his opposition to the underlying bill that would force a government takeover of the internet, stifle competition and lead to new taxes and fees. “I rise in support of the Guthrie Amendment. It really gets to one of the main issues that we’re talking about here when you look at the idea of going to Title II classification for internet service providers. 5G network is being built out by private investment. This isn’t taxpayer money. This isn’t part of some government program. It’s a lot a of big companies, who compete fiercely against each other for consumers, who are each spending billions of dollars, not just because they want to go and build something that nobody uses, because they want to build something that they hope somebody is going to buy. If they’re not building it good enough, if they’re not delivering their product effectively enough, then people are going to go somewhere else. “I know it sounds like a crazy idea. Free-market economics, to some people around here, has been lost in this whole shuffle. Because maybe they want government money to be paying for it. I don’t. I want the private sector to be the ones that build out 5G. That’s how we got 3G, 4G. You look at your device, and people today, what they expect out of a 4G network, they would have loved back when you just had maybe a brick phone, which we brought around before. But they wouldn’t allow that today because we’ve come so far through this private investment. Then you come along and say, ‘After all those people have spent private money, we’re going to now treat it like a regulated utility,’ which it’s not. “What’s so broken about the internet that you need the government to come in and fix it? But once the government’s in, they’re all in. What you see in any government agency ultimately takes hold. It’s going to be regulations that slows down that investment. The investment slows down, all of the sudden your phone slows down. You get that little dial signal you used to get, that little hour glass that went around and around. You don’t get that as much anymore. With 5G you’ll be able to stream things. You can go to YouTube, you can go to Netflix, and you can see things in live action without buffering. One day they’re going to actually have to google the term buffering because of all the private investment so that you don’t have it anymore. So that people can see things much quicker, much faster, access and retrieve more data in a quicker time. “It happens because there’s fierce competition. In fact the competition is so fierce for consumers, there’s also competition for the people that pitch the ads. Remember the guy that used to go on TV and say, ‘Can you hear me now?’ He’s now working for the opposing company, selling internet service against the company that paid him to say, ‘Can you hear me now?’ That’s how fierce the competition is. Competition is a great thing. We still need to fight for competition because that’s what pushes people to advance. If somebody’s selling a bad product, nobody’s going to buy it. If you want the efficiency of the Post Office from 30 years ago when they didn’t have competition, that’s what you’ll get with Title II regulation. Today, there’s finally competition. “We’ve got a private market place that is so fierce and so competitive prices go down and consumers get more today because of the world we live in. Buyer beware, if you want the government to come and save you from the ills of the internet. Please show me what’s so broken about the internet that you need the government to come and save you from it. Once you bring the government in, they are all in. All the regulations, taxes, the things that ultimately will slow down the innovation, just like they do in so many other places where they go all in. We have something that’s working.